I definitely consider myself a frugalista and thrive on saving money. 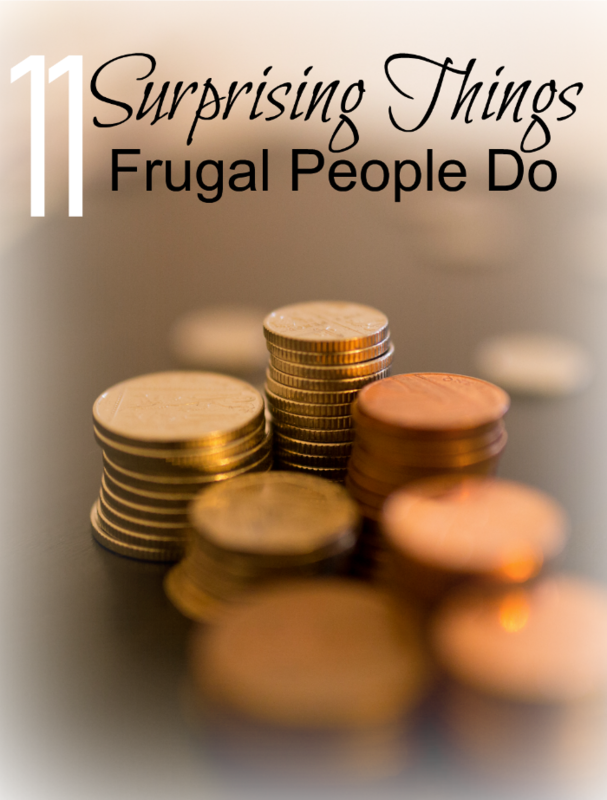 But there are a few surprising things frugal people do that you may not know about. Being frugal doesn’t always mean never spending money, nor does it mean keeping all your cash in envelopes. Just like we are all different in personalities, frugal people are different in ways they save. However, there is one thing all frugal people have in common. A Goal. Whether that goal is to retire early, build your dream home, adopt, live debt free, or any number of other things; our goals are the motivator to being frugal. 1. They know where their money goes. A person who is truly frugal will have some sort of system for tracking their spending. They may adhere to a strict budget, use the Dave Ramsey envelope method, or systematically keep account of all their income and expenses. 2. They use credit cards. Depending on the tracking system a frugal person uses, they may exclusively use credit cards. We are in this group. We found a card that offers great rewards and use it for everything. If I can figure it out, we plan to use it for making our house payment. This would earn us a minimum of $100 each year in rewards. By using our card exclusively we are able to earn a couple hundred back each year in rewards which are used to do fun things as a family. Since I typically do bookwork 2-3x a month I simply make a payment for the amount we owe the cc each time I do book work. I messed up once last year and paid $7.65 in interest, that was a bummer and I haven’t made that mistake again! The idea of being frugal may leave you thinking you cannot spend, but that isn’t totally the truth. A truly frugal person understands what it means to make a good investment. There are household expenses that aren’t always cheap but a frugal person will do their research and find the best item for their money. Then they will watch for sales and use programs like Ebates and Cardpool to make their money go even farther. As a homemaker, I put together a list of items that I spent quite a bit on, yet they have each more than paid for themselves over time. A frugalista understands that she must sometimes spend to save. I still read every post I come across that talks about ways to save. I don’t always learn anything new, but I still find helpful little hints here and there. I also choose to learn about my health, or our food, green energy and even how to make handyman repairs and much more. I replaced the pump in our washer when it went out, and hubby has learned to weld, make electrical repairs, work on 3 different vehicles and so much more. He is also the one who takes care of our landscaping. Sometimes saving money comes in a ridiculous form. For instance, the fact that we own 3 different vehicles seems crazy, yet the savings has been equally crazy. Making your oil change last a few more thousand miles may seem like a good idea up front, but the overall wear and tear on your car isn’t worth it. Not cleaning your furnace may seem like a way to save, but it could also burn your house down. A frugal person understands that repairs and maintenance are important to making their possessions last longer. Being content isn’t always easy. But we have learned, and are still learning the art of contentment. New cars are nice, but used are far more affordable and if you’ve done your research, a used car will still serve you many years. Sites like eBay, Craigslist, FB Yard Sale groups and more are the frugal buyer’s best friend. When setting up our first home, Jason and I bought 3 items new. Our mattress, a chest freezer and a baker’s rack. The mattress was a floor model we got half price, and the other two items were on sale but purchased new only because we couldn’t find them used. New is just over-rated most times. We now have more new stuff that we’ve added over the years, but our original used furniture and other items are still great! I hate having extra “stuff”. Obviously craft and sewing items or things like screws, nails, extra pvc and wood are carefully organized so we know what we have. But that sweater I haven’t worn in two years, or that kitchen gadget I’ve used once 3 years ago? Yeah, they need to go. Frugal people love being able to declutter as it simplifies their life and much of that “clutter” goes into the garage sale pile and signifies more funds to put towards their dream! Frugal people understand that hard work is really the only thing that pays. Jason works a lot more hours at his new job so has less time for side jobs, but he still finds time for a few here and there. With me being a mommy, picking up short-term babysitting jobs and/or cleaning jobs isn’t as easy and I rarely do that anymore. However I’ve still managed to find little side jobs here and there to do and I’m putting as much time as I can into my online work as well. Every little bit helps and we make good use of it all! A true frugalista understands that while it looks thrifty to buy the cheapest foods possible; good health has no price tag. If you aren’t healthy, it doesn’t matter how many dreams you reach when you cannot enjoy them. To be honest, eating healthy is often cheaper. Don’t believe me? Check out this post that shares how we went from an average of $14 a day to feed to 2 people, down to $13 a day to feed 3! We also learn to make a lot of stuff from scratch. Like bread, yogurt, coffee creamer, gummy vitamins and so much more! Eating healthy foods is one area that we aren’t so frugal in, but our health is very important. Everyone has different needs and I do not have an exhaustive list here, but finding savings programs that work with your budgeting styles is very important. I’ve also learned how to get free stuff on my birthday and use digital coupons like these for those last-minute emergency runs to the store. We are very frugal and try to live well under our means. However money isn’t everything in life and we try to live out that understanding in practical ways. We discuss various needs together and try to help out in little ways. We also see the need for taking time off, and time away. Typical vacations are rare for us, and when we go on vacations we still manage to be quite frugal while having a lovely time. Family is important and they don’t all live close by. Many times we will save up just for traveling to see our family. Here’s how we save for our vacations and for those unfortunate days when we are sick/cannot work etc. There you have it, 11 surprising things frugal people do. Did you know all these? Do you consider yourself frugal? Great list! I’ve certainly learned the hard way that buying the cheapest option isn’t the most frugal. And not keeping up with maintenance isn’t very frugal, either! Goals are so key to maintaining a frugal lifestyle and you’re right, being frugal doesn’t mean you never spend money and never have nice things. It’s more about being mindful and deliberate about where your money goes. It’s so true that frugal people have a goal. Our goal in this season is to make it on my part-time salary while my husband makes a career transition. We’ve started watching our expenses like a hawk and actually tracking our expenses. We’re loving the EveryDollar app by Dave Ramsey’s peeps. So far so good in January! I also like to use my credit cards, responsibly of course. I’ve seen a lot of lists like this one that discourage the use of credit cards. A lesson from my mother: If you’ve had your credit card for a while and you miss a payment, all you have to do is call and tell them you don’t want to pay the interest, they’ll usually credit you back the amount on your next statement. Obviously this isn’t something that can be done all of the time, but I have successfully used this tip more than once! Ebates rewards and that 6% cash back from grocery stores on our credit card get us all giddy! Great tips. Thanks for sharing at Merry Monday. Tweeted.